The School of Art + Design presents an exhibition curated by our first-year MFA candidates in Ceramics, Sculpture, Printmaking, Painting, and Graphic Design. The show will be on view February 12 – March 9, 2019, with a reception on Thursday, February 14th from 6-8 pm in Ohio University’s Trisolini Gallery, located on the 4th floor in the Baker Center. Refreshments and hors-d’oeuvres will be provided. This exhibition will feature a group of artists from a variety of backgrounds, using diverse approaches to create sculpture, pottery, video projection, prints, and paintings. This exhibition will synthesize the explorations of the newest graduate students as they work through their first year in the program at Ohio University. Trisolini Gallery, located on the 4th Floor of the Baker Center, is open from 10 am – 4 pm Monday through Saturday, and 10 am – 8 pm. on Thursday. 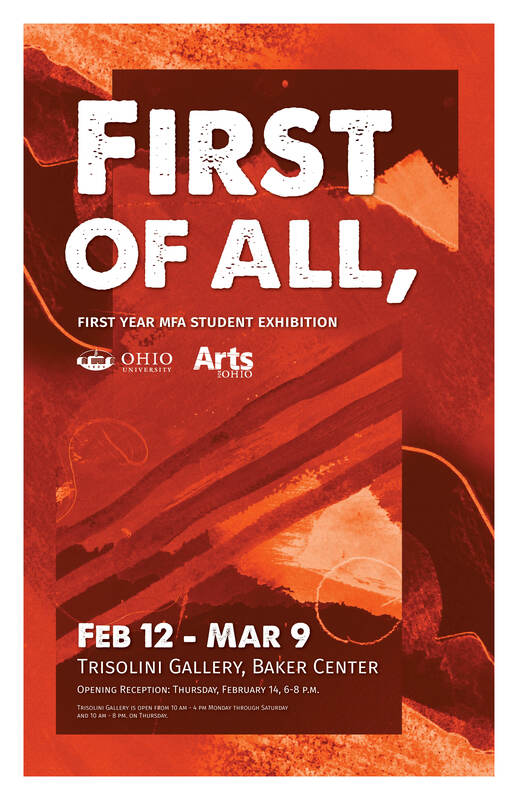 This College of Fine Arts event is made possible through support from Arts for Ohio.